At only 6.2 mm thickness, the RS Series relay module features a slim DIN Rail mountable interface solution. 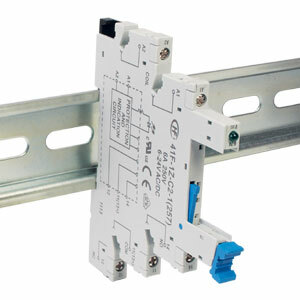 The modules have a plug-in construction and are available with or without the relay. The built-in LED indicates the relay energizing state. The relay features a SPDT configuration and a maximum switching current of 6A. It is available with several standard coil voltages from 5 Vdc up to 230 Vac/Vdc. There is a provision for fitting pluggable jumpers which reduces the wiring time. The modules have screw terminals with finger protection for wire termination and offer an IP20 protection rating. The relay has an IP67 protection rating. Both the relay and the module are UL recognized.